Not ever having been a cheerleader in middle school or high school, I don't relate to this one as personally as some of the other anti-feminist things from my younger days, but I was reminded recently by an old episode of Freaks and Geeks that, before every big football or basketball game, the cheerleaders at my school always showed up early on game-days in order to decorate the lockers of the (always male) players. And I always thought that kind of sucked for them. 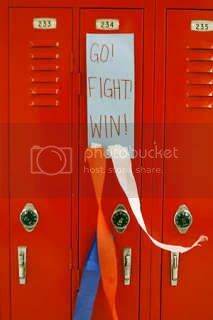 So why was it necessary for the girls in cheerleading to get up an hour earlier to come to school and adorn the lockers of players they may or may not have personally liked very much with crepe paper, balloons, and glittery nametags? I'm not sure if this activity was required by the cheerleading coaches or if it had just become enough of a tradition that it was a social requirement, but I really do wonder how many of the players actually cared that it was done or if any of them ever saved and scrapbooked their glittery basketball-shaped nametags. I also never saw any football players decorating a cheerleader's locker the school day before a big competition. I'm just sayin'. Does anyone know if this practice is still in place in schools? When I was in high school (about 5 years ago), I was on the crew (rowing) team. We made locker decorations by boat. One person out of each boat would make the locker decorations and it would rotate before every regatta. So it was women making decorations for women and men making decorations for men. So, that's a little bit of a different take on what you are talking about. But the cheerleaders did it for the football team too...so yeah. We did it for our teams, and I guess the cheerleaders did it for the guys' teams (and for each other), but it was always a spirit thing, and the way our school worked meant that there was a time when most people were assembling long before classes started, so nobody had to come in especially early to do it. Still, I see where you're coming from. Yeah, I get there's fun in locker signs in general, but if it works out so that one gender group is always doing them for another, that reeks of sexist institutions. Now, if the teams did them for each other, or if they did them for themselves, it would be a different story. Yeah, no, I'm pretty sure the cheerleaders did it for themselves. It got them attention from the football players, and that's what all the normal girls were all after in high school. It's not degrading if you like it, right? It's funny that you bring up the football games, though, because it didn't really hit me until just now how much we were supposed to care about watching those guys and how little we did. When I was in high school (over 10 years ago), I was on the dance team. Between the cheerleaders, dance team and majorettes, there were roughly as many girls as there were guys on the football team. Now, I went to high school in rural East Texas - NOT a bastion of feminism by any means. And yeah, we totally decorated the players' lockers most Fridays. But their coach made them do stuff for us as well. For instance, they used to leave carnations on our cars, decorate our lockers at least one day during homecoming week and make care packages for each team when they went off to their respective summer camps. Was it entirely equal? Probably not. In fact, I'm sure it wasn't. But it was never presented to us like, "These guys are so cool and you should feel honored to do something for them." It was more about team spirit. And the guys never acted like it was their obvious due or anything - they always seemed grateful. If they hadn't, our coach (a superfeminist) would never have let us take part in the first place. Part of the guys' attitude came from the fact that the dancers and cheerleaders shared a workout room and trainers with them. They didn't see us as just a bunch of chicks because they KNEW we were pretty badass athletes ourselves. Interestingly, at my high school, the dance team had what essentially amounted to manservants. I can't remember exactly what we called them - guards or some such, I think. Basically, four to six guys dressed up in button-downs, ties and khakis, carried our gear and escorted us wherever we needed to go at football games and competitions. It was a big, BIG deal for them to be chosen, and a lot of guys applied for the position every year. The upshot for them was occasionally catching a glimpse of boobie as we changed costumes between performances, I guess. plumpdumpling: I disagree. If that was the case, it would have been some cheerleaders making signs for just some of the players, but instead they got together and did it for all of them every damn game. And I'm not even sure it got them any attention, since I doubt the guys they may would have wanted to impress cared one way or another if they had a locker sign. Maybe we should decide to go to our high school reunion just so we can ask them about it. Kelly: I love that the guys reciprocated at your school. That's all I would have liked to see at my school, but I never did. I'm decorating lockers for my daughter's field hockey team. And BTW she is in the highest band at her school as well (most of the athletes in the school play an instrument). Sorry if locker decorating made you feel less than important...I don't remember my school decorating lockers at all. But I like the idea, this helps pump them up for their game. My daughter does not like the cheerleaders...and they are NOT there to pump up their school spirit (haha) they have become alien in their school because of the way they act. Perhaps some of them have been forced by their mothers to be a cheerleader, who knows? I just know the kids at the school prefer the band to be their spirit guides rather than the cheerleaders. I live in (Alberta) Canada, and I don't think cheerleading even exists here. My school doesn't do it, and I haven't heard of any others that do.